“On Monday noon, the two houses of the Legislative Assembly convened,” and the fireworks began immediately. No, this is not about the 2019 session in Helena. It’s a look back at Montana’s very first territorial legislature, which convened in Bannack on December 12, 1864. 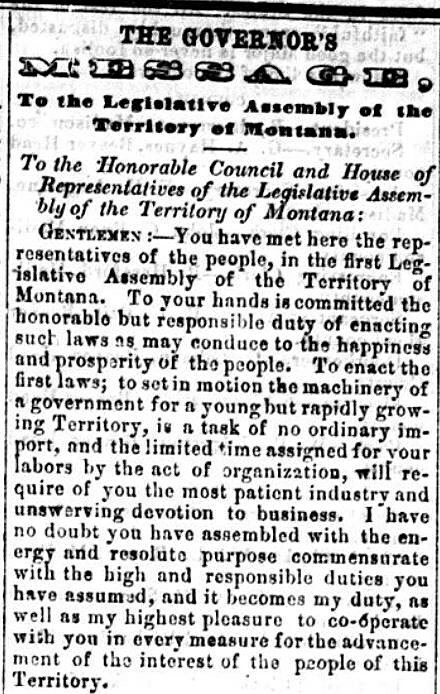 According to the “special correspondent” for the Montana Post (the Territory’s only newspaper at the time), Governor Sidney Edgerton greeted the newly minted lawmakers with a demand. Now these days, that would seem reasonable enough, but this was 1864. One young Montana legislator named John Rogers had come to the Territory from Missouri, where as a state militia captain he had fought against Union Army occupation of the state. But when his commander moved to make the militia part of the Confederate Army, he resigned. Rogers, knowing he couldn’t swear an oath containing the “arms against the government” provision, called on Governor Edgerton to see if he might compromise. For some time, Edgerton and others had painted a picture of Montana being settled by Confederates, even naming Rogers as an example, “skulking in the gulches of Montana inciting treason.” The viewpoint was repeated so often by the Montana Post, it became legend. In Peet’s account of the meeting with Edgerton, “Rogers told the governor why he would not sign the iron-clad oath. He would not perjure himself. Rogers finally just gave up and resigned his seat over the matter. Meantime, the Montana Post’s unnamed “special correspondent” delighted in chronicling the events in the legislature as members were confronted with an insinuation they may not be paid until they took the “iron-clad” oath. If you were to rely solely on those newspaper accounts, you might believe this partisanship was pervasive, not only throughout the session and throughout the Territory. But that really wasn’t the case. But Wilson also discovered that if you read the diaries of miners you find that “most Territorial settlers – except for officeholders, office-seekers and newspaper editors— were more interested in acquiring wealth and building a territory than in political controversies. Despite the political antagonism, Montana’s first session did produce dozens of pieces of legislation, only two of which were vetoed by the governor. John Rogers went on to be re-elected to the 1866 and 1872 legislatures, for a time serving as Speaker of the House. 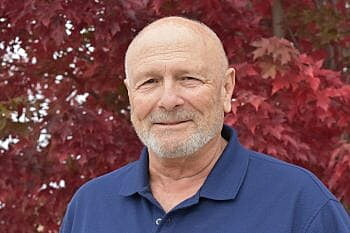 As for that “special correspondent” hired by the Montana Post – there is some evidence it may have been an insider – Missoula’s Frank L. Worden, a member of the legislature. But all these years later, no one knows for sure.